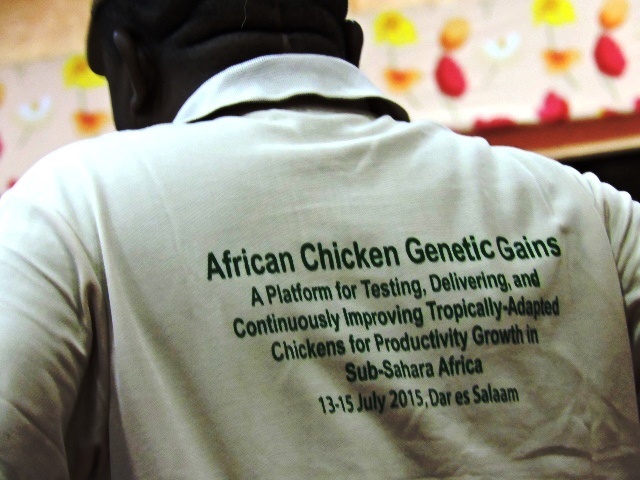 A new project with the visibility and scale like the African Chicken Genetic Gains (ACGG) project deserves a strong communication approach, especially when the project team is keen on earmarking resources and attention for communication and ‘working out loud‘. … or why invest in communication from the start? A lot of research projects at the International Livestock Research Institute (ILRI) and beyond do not include (much) communication in their budget and plans. The project teams then typically wake up on the comms call only when they realize they would like to have some media coverage for their launch event, and some help at the very end of the project when the publications start piling up and editorial and publishing support is sine qua non for the success of the project. The ACGG project was a different case. The team, led by Tadelle Dessie and coordinated by Jasmine Bruno (ILRI) bought, from the get-go, into ‘Comms’. Perhaps because the project team is based in Addis Ababa and the campus has given opportunities to witness successful comms and KM support to various research projects (Nile Basin Development Challenge, Africa RISING, LIVES), there was willingness and interest right away [it was also budgeted in the project proposal …]. The benefits are multiple: good visibility of the research, strong engagement, more solid partnership development, more chances for research uptake etc. etc. Add some of that glue and grease, please! So how did comms (encompassing traditional communication and public awareness with knowledge management) get funded and developed within ACGG – and play that role of ‘glue and grease’ that it does in the best of times? It took several stages. During proposal development, Tadelle Dessie (project leader) and Peter Ballantyne (Communication and Knowledge Management team – CKM) discussed ideas and directions for comms in the upcoming project, roughly identifying areas and budgets. The CKM foot was in the ACGG door. After project approval in November 2014, it was relatively easy to continue negotiations about the role of comms in the project. Ewen Le Borgne was asked to coordinate project communication and he and the ACGG team specified how CKM would support ACGG in detail. Based on past experience the CKM team developed a communication and knowledge management plan/strategy (rather pragmatic plans than long-term strategy). With a plan in place, people were mobilised from the program and the CKM side, including Tsehay Gashaw for engagement and collaboration, Meron Mulatu, Apollo Habtamu and Betty Alemu for publishing and design work, Paul Karaimu and James Stapleton for editing (and writing of e.g. briefs)… In addition, during a visit to Nairobi, the CKM team there met with the ACGG project team and identified other ways to support the project. Currently the team is implementing the plan, including providing regular process support to the research team – through monthly gatherings to review important work that comms can support. The future looks promising. The dedicated comms budget is essential. Luckily it was outlined before the project was submitted, which is more than most ILRI projects manage to do. Earlier inputs to projects rom Comms – as well as capacity development, gender, and so on -is something our ‘One Corporate System’ promises to facilitate. The relatively large project never budgeted for full-time dedicated comms support (as is the case with e.g. Africa RISING or LIVES). This has left some gaps, especially around systematic, regular content generation and dissemination. Large and complex projects should have dedicated full time comms expertise. One of the important adjustments, to fill the content production gap, has been to develop a content plan and calendar where a number of possible content items have been identified. This rolling plan should help generate regular content and align activities with content and events. In the process this ensures that all relevant ACGG work is indeed documented and disseminated. The comms plan was developed mostly by Ewen Le Borgne with support from Peter Ballantyne and shared with all other CKM staff involved in ACGG. However, the Nairobi team was less involved and critical inputs around awareness and advocacy work were missed early on. These are now being included in the plans. A project of this nature evolves very quickly with multiple activities, events and partnerships happening in parallel. Regular meetings between comms staff and the project team (as is the case with the monthly chats organized) are a must to keep abreast of, and if possible anticipate, everything (especially without a full time dedicated comms person). As is often the case with new projects starting, ILRI CKM uses a bouquet of standard platforms and this is helpful to have a well-oiled routine that can be rolled out, but also (e.g. using the project work space / wiki) to keep track of principles of work that can be referred to. Branding for instance needs quite immediate attention and can be organized much more quickly if a project website and wiki is already up and running and that is part of the understanding of working with CKM. ACGG takes place in three countries (Ethiopia, Nigeria, Tanzania) but CKM is formally present only in two of these countries, not in Nigeria. Identifying comms allies that can do some comms work in those countries – if only for important events – is essential to ensure all countries are covered adequately. One of the lessons from the Africa RISING project was that people close to the ground were necessary to ensure representative coverage of the entire project. Luckily the ACGG team is keen on learning and adapting along the way. Nevertheless, dedicated efforts are required to properly document major developments. Process documentation is an important building block for keeping track of all the learning. The earlier starting this the better, as early learning is quickly lost unless well-documented.